WillingToBeLucky.net: New Iron Man 3 poster! Don Cheadle! Iron Patriot! A new IRON MAN 3 poster released today by Marvel on the Official Iron Man Facebook! 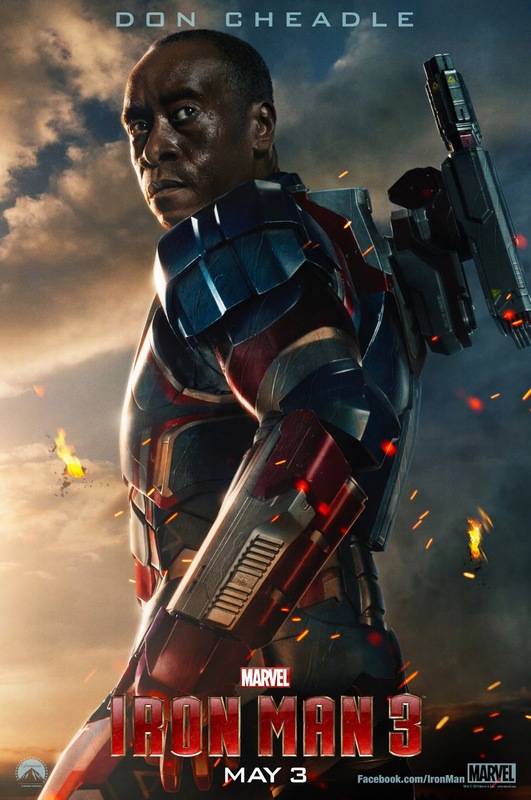 It feature Don Cheadle as Iron Patriot/Rhodey! As you may recall, Cheadle donned the War Machine suit in Iron Man 2! Can't wait to see him involved in more of the action! Marvel Studios’ “Iron Man 3″ pits brash-but-brilliant industrialist Tony Stark/Iron Man against an enemy whose reach knows no bounds. When Stark finds his personal world destroyed at his enemy’s hands, he embarks on a harrowing quest to find those responsible. This journey, at every turn, will test his mettle. With his back against the wall, Stark is left to survive by his own devices, relying on his ingenuity and instincts to protect those closest to him. As he fights his way back, Stark discovers the answer to the question that has secretly haunted him: does the man make the suit or does the suit make the man? IRON MAN 3 is set to hit cinemas 25 April in the UK & May 3 in the US! Catch it in IMAX 3D at at theatre near you!! !